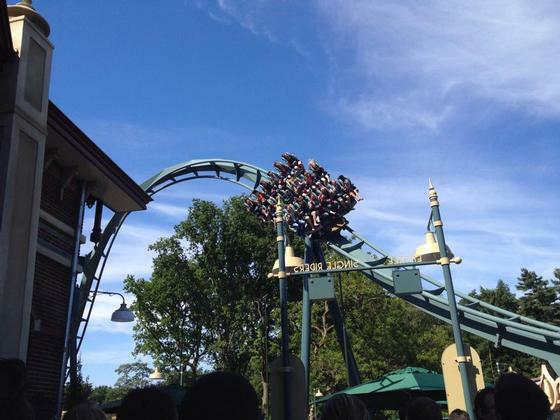 July 1, 2015, 8:57 AM · Today marks the day that The Efteling's new roller coaster Baron 1898 opened! We were there to celebrate the occasion and report back to Theme Park Insider. Arriving at 9:30am we got in 30 minutes before the 10am opening time, using the "Ticket Extra" deal. At this point, only a fraction of the car park was filled. Once in we ran through the park in hopes of getting an early spot. We quickly realised however that they'd gated off the wing of the park containing the Baron ride (we suspect this was just for today). These inner gates only opened at 10am followed by a mass run of squealing Baron fans (us included), reminiscent of scenes from Jurassic World running away from the from the raptors! After funneling into the lines (single rider or group), which have been well built up since the creation of the promo videos, halfway along you are given the option of either selecting a front row seat with a longer line or 2nd/3rd row seats at half the time (with the initial single-rider line being the fastest of all the options). Being the first part of the day most selected the front row, creating opportunities for people near the entrance of the queues to jump a rail into the 2nd and 3rd row positions. Once we were in the line it took a good while before the rides officially began operating, sending a number of test rides around the circuit, a couple of these had quarter-filled groups filling the seats. We believe the initial small groups were a mixture of park staff and radio competition winners which was cool. Rides officially began running consistently at 10:20am, nearly a full hour after we entered. Once they were running they were running at 18 people (three rows of six) approximately every 1 minute and 33 seconds. 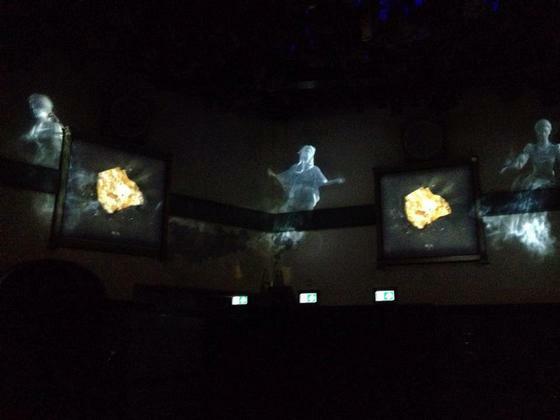 The theming really begins once you enter the building, where in the first room you are presented with the story. A mining baron appears in black and white on a projector screen explaining that he's seeking to find fortune and he's sending you, his miners to go and get the gold! The projection is interrupted by some "white women" (i.e. ghosts) who are the guardians of the gold. Articles in the room begin shaking, lights start flickering and the baron encourages you to not to be put off but to push on! 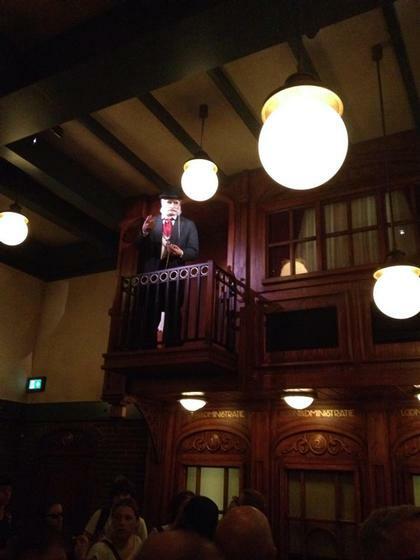 In the next room you meet the baron, an impressive, full-sized animatronic who gives you further instructions. Then the doors open to the ride itself. You hop on the ride, they check your restraints, giving the all clear, the ride moves forward through mist where you encounter the white women once more who tell you (in Dutch only) that you were warned and therefore you shall now face the consequences. Things begin shaking and moving before you move on and up the tower. 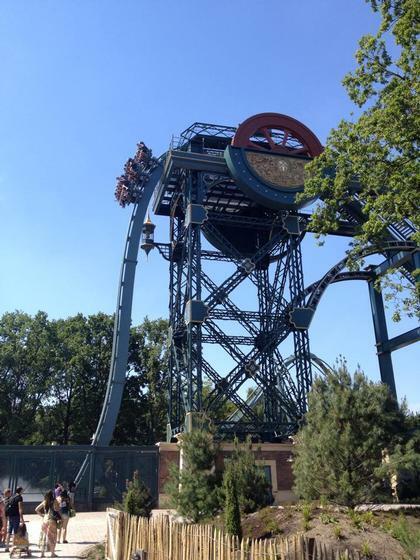 At the this point comes the climax of the ride where you reach the top of the tower and pause, just before plunging vertically in to a white wall of mist at the entrance of the mine below. This is followed by a rapid series of twists and turns along the rest of the track (outside). The ride itself though reasonably short packs in a lot of thrills and is very smooth. It's a lot more fun than I'd been preparing myself for. We came off buzzing! Can't recommend this ride more! Once we left the ride we were given a souvenir CD, containing a remixed single of the rides sound track, very cool. 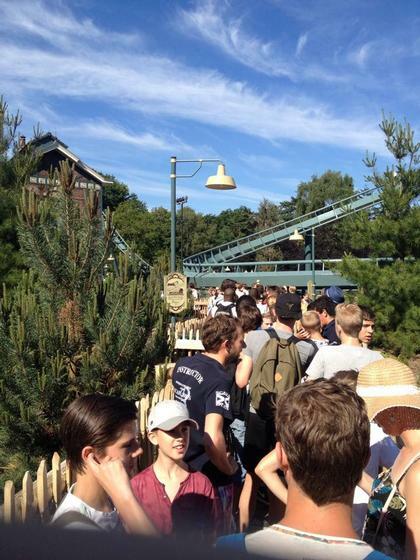 We also saw that the line had grown significantly, extending far beyond the ride lines, over two hours in wait! The Efteling has really done itself proud with this one! July 2, 2015 at 2:31 AM · Rode it yesterday, at the end of the afternoon. The line was indicated as 40 minutes, but getting into a front-seat took exactly 35 minutes. There is a separate line for the first row and a combined row for the second and third rows. - The pre-shows are short and great. They really add to the experience, but I wouldn't go to this ride just for the pre-shows. - The lift-hill is fast, the moment when you're held at the top is awesome. You really can't predict when you're let go. - The ride itself is short and sweet. It's super smooth as you would expect from a B&M. There is a fun hop at the end. - The theming overall is amazing. There are some small spaces and corridors you just pass for a few seconds, but there are details everywhere. It's bit of a shame that there isn't really a queue line inside so you take in all these details. On the other end, it gives you more reason to ride again. Which I'll happily do in the future! July 2, 2015 at 4:55 AM · Remember that, there was the executive business goal of getting Efteling towards a 5 million yearly attendance "soon". Main attractions that drive a theme park over 4-5 million attendance, need to be NOT under THRC +-1150. If the park goes over 6-7 million attendance, same needed THRC should not be under +-1300, etc. Plain business planning.